The purpose of this award is to RECOGNIZE AND ENCOURAGE EXHIBITORS WHO HAVE WORKED HARD FOR EXCELLENCE OF PRESENTATION but who have not been awarded the show Gold medal. 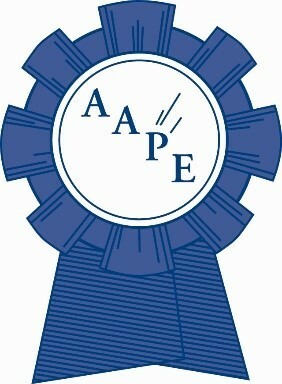 If possible, the AAPE Gold Awards of Honor should be given to two different award levels. In other words, AAPE would like to have excellence in presentation rewarded regardless of the medal level of the exhibits that win them. This is not an award that should automatically go to the higher medal levels. For example, if there are five levels of awards, it is possible that a Bronze exhibit and a Silver exhibit each be awarded an AAPE Gold Award of Honor. In addition, the two awards should be presented as equal awards, not as �AAPE Gold Award of Honor First� and �AAPE Gold Award of Honor Second�. Title Page: Does it aid the viewer in following the exhibit�s logical progression? Is it written in concise, yet descriptive terms that act as a �road map� for the viewer of the exhibit? Logic of presentation: How logical is the sequence of the pages in telling the material�s story? Is the material pertinent to and within the parameters set down by the title? Does the exhibit have a beginning, middle and end? Neatness: Are the pages clean? Is the write up method neat and tidy? Are the mounts subtle and even? "CREATIVITY IN PHILATELIC EXHIBITING MEDAL"
Use of humor to focus the viewer on the philately being shown. The exhibit chosen must consist of at least two frames and must show philatelic merit sufficient to earn a unanimous show Silver-bronze award or higher. In other words, a single vote among the accredited jury for a Bronze disqualifies an exhibit from consideration. The award will be given only if there is an eligible, clearly recognizable candidate. This award is for the best by a first time exhibitor at an APS World Series of Philately show winning a Bronze medal or better.